I am always amazed at how simple and delicious these Barefoot recipes turn out. I have to admit that I wasn't expecting to like this one so much. I have heard of it before, but never tried it, so I thought that bread salad might be strange. Oh, how wrong I was! This was delicious. 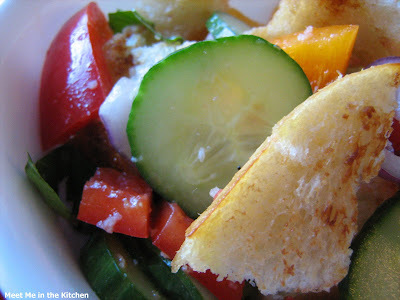 Homemade croutons, essentially, with tons of fresh veggies and a wonderful vinaigrette- WOW! We loved it. I did make a few changes- I reduced the amount of oil that was used to saute the bread cubes to 1 1/2 Tbls, used white wine vinegar in the vinaigrette (Thanks Anne! ), used an English cucumber, and reduced the amount of oil in the vinaigrette to 1/3 cup. Delicious! Go check out how the other Barefoot Bloggers felt about this one! Your salad looks great, but I want one of those cupcakes!!! I'll take one salad, and that cupcake from yesterday. It looks great and I did the same thing with the oil. Mmmmm! Love this kind of salad. It's been a while since I've made one. This sounds like a fantastic recipe. Love looking at all these panzanellas. Yours look fresh and delicious! Fresh and delicious! Your salad looks wonderful! I love your close up photos, they are amazing. I, too, would like a cupcake. Please? Mmmm, this one was so good! Ina wins again. I'm glad you reduced the oil. I don't think I even measured mine (which means I probably ended up with a lot less than called for). I need one of those praline things from yesterday. Oh my, those look delish! I guess they kinda cancel out the salad though, right? 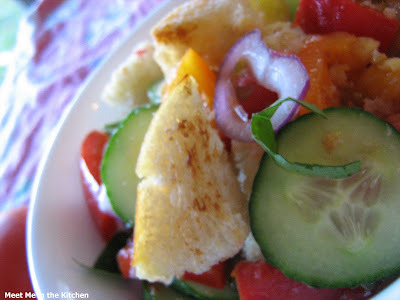 I loved this salad too...very summery! Yours looks great! I didn't measure my oil so I think I ended up with less...hopefully! Glad you enjoyed it! I loved this salad too! How could you not with all those yummy veggies and uh...bread!! Wow! My friend Marieke introduced me to this type of salad some years ago... It became a staple every summer. I haven't made it since I went wheat free. Yours looks delicious. We will DEFINITELY be making this soon. I love all the ingredients in here. By the way, have you ever tried bread soup? I can't remember the Italian name for it, but it's delicious no matter what it's called.